The philosophy that Dr. David Shuter has followed throughout his career attempts to answer the above questions in an ethical and honest way. Thousands of satisfied patients can attest to this. Indeed, almost every patient that Dr. Shuter cares for is sent to him via patient referral — in other words, from a happy patient with a good result. As a board certified Plastic Surgeon and a member in good standing of numerous prestigious societies, Dr. David Shuter has the appropriate credentials that patients desire. However, he warns potential patients to carefully research their doctors. Are they board certified in Plastic Surgery or in a different specialty? Do they have hospital privileges for the procedure or can they only work out of their office without any surgical peer review. Is their office facility licensed or is it just a room in the office. Dr. David Shuter is glad to answer these questions and recommends that any pontential surgeon do the same. He also recommends that patients call their local societies and specialty societies to back up any claims of membership. Dr. David Shuter is glad to provide a practice brochure including CV upon request by calling: (561) 743-0244. 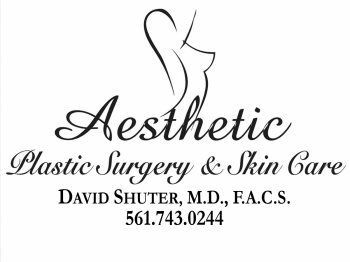 Dr. David Shuter is a Board Certified Plastic Surgeon and member of the ASPS (American Society of Plastic Surgeons (ASPS) as well as numerous other related societies. His office is proud to offer a full range of Cosmetic Procedures and Ancillary services. Dr. Shuter often cares for out of town patients. His office can assist in appropriate hotel reservations, private nursing, etc. and will make the cosmetic surgical experience as comfortable as possible (please see Fly In for Surgery by Dr. Shuter). Dr. David Shuter is glad to provide a practice brochure including CV upon request by calling: (561) 743-0244.